2002, Dec. 19, Ritzau: The case continues and MAP is to stay in prison. 2002, Dec. 18, Ritzau: The case against Amdi Petersen started today in the court in Ringkoebing (picture right), 2 months before schedule. He was questioned all day about his role in the Teachers Group. He denies being its leader. 2002, Dec. 8, DR-TV, Soendagsmagasinet: Documents show that MAP in the early 90's planned to place TG money in overseas tax havens through 36 different companies. The documents name Farmer's Trust as the key money bin holding 90 Million U$D. 2002, Dec. 3, Dagens Nyheter (Sweden) Research documents, that an estimated several million kroner profit from collecting used clothes in Sweden is channeled to tax havens. Top guy, Dan Wallin, has left UFF Sweden for the same reason. 2002, Dec. 3, Ritzau: MAP is staying in jail until Dec. 19th and probably also during the holidays. 2002, Nov. 29, Jyllands-Posten: Members of the TG has bought a BMW X5, a V8 4x4 that costs appr. 1 mill. DKr. in Denmark (ca. 150.000 Euro). The paper speculates about the expensive ride that MAP is going to get when he is released. 2002, Nov. 24, DR-TV, Soendagsmagasinet: Documents originated from Tvind show the Top 30 of the TG hierarchy. Names are visible on the screen. (Amdi Petersen is second to Kirsten Larsen!) Tvind spokes-person, Karen Hesselbjerg, says that the papers are old and only show the division of tasks in the TG and that all TG members are equal. 2002, Nov. 20, Fagbladet, The workers that were fired from the Rio Culebra plantation in Ecuador are fighting to get proper compensations. They have been offered a few hundred dollars but say that they have a right to much more. 2002, Nov. 18, Ritzau: The police can't have the emails from non-charged members of the TG, according to a ruling by the court in Ringkoebing. 2002, Nov. 13, DR: The police are trying to get hold of more encrypted emails to and from the Tvind leadership. They say that they still haven't established who gave the conrete instructions in the TG. 2002, Nov. 7, Ritzau: Amdi Petersens jailing has been prolonged by another four weeks according to a ruling of the court in Ringkoebing. 2002, Nov. 6, Roskilde Avis: Another Tvind institution for problem kids is opening in Roskilde, "Anden sal til Hoejre". 2002, Oct. 22, Jyllands-Posten: For the first time Amdi Petersen has agreed to give his version of the story to the police and thereby given up his right to silence. 2002, Oct. 10, Berlingske Tidende: Amdi Petersens time in custody has been prolonged by four weeks. The police argues that judging by AP's personal notes confiscated in Los Angeles he was planning to establish a new TG refuge in Pulgas, Mexico. The costs of the court case will be 33 mill. Dkr. or appr. 4½ mill Euro. 2002, Oct. 9, Ritzau (De bergske Blade): Bodil Ross Soerensens lawyer, Bent Unmack Larsen, has excused himself from the case due to old age as he explains it. Ms Soerensen hopes to be able to employ the highly profiled defence attorney Merethe Stagetorn. 2002, Oct. 9, Dagbladet: The town council of Roskilde is considering banning the UFF/Humana collection boxes from public space. 2002, Sep. 30, Jyllands-Posten: Chances are slim that Amdi Petersen could be released before the case against him starts Feb. 19th next year. 2002, Sep. 27, BT: The appeal case in Vestre Landsret (district court?) went against Amdi Petersen. He is staying in custody waiting for the criminal case against him. The prosecutor argued that Amdi Petersen had a double identity. He had two sets of business cards when arrested in LA. One set with the name M. Pedersen (with a 'd' instead of a 't'. This is probably why he regularly is called Pedersen in the documents concerning the case.) The other set was in the name M. Cordoba. 2002, Sep. 16, Ritzau: Amdi Petersen is to stay in jail, says Ringkoebing judge. 2002, Sep. 15, Ritzau: Former TG economy manager, Steen Byrner, has sent a letter of support for Amdi Petersen to the court taking responsibility for some of the transactions in question. Steen Byrner lives in Ecuador and claims to have no connection with Tvind or the TG. At the court hearing today Amdi Petersen pleeded not guilty. He appears to be in good shape. The courts decision - whether Amdi P. should stay in custody - will be published Monday morning. 2002, Sep. 15, Politiken: Amdi Petersen arrived at noon Saturday September 14th in Copehagen airport. Hiding his face police rushed him to the court jail in Ringkoebing. 2002, Sep. 14, Politiken: Amdi Petersen is on his way home. 2002, Sep. 10, Ekstra Bladet: Amdi Petersen has asked for another lawyer. Two lawyers have been appointed to Poul Joergensen and Amdi P. wants the same priviledge for himself. 2002, Sep. 5, Fagbladet: The last 120 of 230 workers have been fired from the Rio Culebra plantation in Ecuador. Armed guards barred them from going to work. Earlier attempts by the workers union to start a dialogue with the Tvind ownership have now failed. 2002, Sep. 3, Berlingske Tidende: A paper made by some (leading) members of the TG wants to explain why Amdi P. is innocent. Berlingske Tidende tries to sell it as a sensational disclosure of internal Tvind affairs but the paper is really just a compilation of arguments that we already know. 2002, Aug. 30, Kristeligt Dagblad: UFF (Humana Denmark) are still keeping their incomes and expenditures a secret. 2002, Aug. 25, Berlingske Tidende: UFF/Humana are selling used clothes to cheap to Channel Island companies run by Tvind. This way Tvind drain the humanitarian activities to the benefit of purely commercial companies that are selling the clothes at high prices in Eastern Europe. An eye witness and documents support the allegations, says journalist Michael Bjerre. (See also Dec. 29th, 2001) Tvind claim that the low prices are due to a slow market for used clothes. 2002, Aug. 23, TV2: Anders Boelskifte expects the extradition to take place within a few days. 2002, Aug. 23, Kristeligt Dagblad: Denmarks largest chain of supermarkets (COOP Danmark, formerly FDB) has banned the UFF boxes from their grounds, appr. 150 in total. 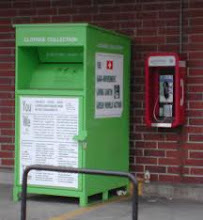 They are to be replaced by Red Cross boxes. COOP Sweden has similar plans. 2002, Aug. 22. Kristeligt Dagblad: Tvind is not complying with regulations when collecting money on the streets of Denmark for the TCE (Fighting AIDS). 2002, Aug. 21, TV2: Anders Boelskifte recommends an unconditional extradition. 2002, Aug. 21, Jyllands-Posten: It seems that the State Department needs to review the paperwork before allowing the extradition. This could take weeks. The terms of the extradition are that no further charges can be brought against Amdi Petersen without the consent of the American authorities. 2002, Aug. 20, Jyllands-Posten: During the court hearing Monday in LA Amdi Petersen himself requested to be transferred to Denmark against the advice of Robert Shapiro - who is losing a client - but in accordance with his Danish solicitor, Anders Boelskifte. Only a few days of paperwork stand in the way of extradition now. 2002, July 7, Ritzau: A Tvind institution in Frederikshavn, "Nordlys", has been closed by the authorities. 2002, July 5, TV2/Tvindalert: 8 Members of the Tvind leadership, Flemming Gustavson, Kirsten Fuglsbjerg (Christine Pipp), Joop Nagel, Anne Hansen, Birgitte Krohn, Birgitte Ring, Marlene Gunst, Else Jensen, have been charged with money laundering in an amount of 3 mio € in Belgium. The case is due to begin Dec. 19th. 2002, June 1, Politiken: Amdi's lawyer is still trying to cut a deal with the Danish public prosecutor - extradition against a guarantee that Amdi is not being imprisoned during trial. Such deals are very rare in the Danish judicial system and the prosecutor has refused the proposal. 2002, May 30, Ekstra Bladet: R. Shapiro, is appealing for the release of his client to The United States Court of Appeals for the Ninth Circuit, Los Angeles. 2002, May 26, Søndagsavisen: Another Tvind Fund, Foreningen til Almene formål af 22. august 1989, has been removed from the list of funds and organizations that can recieve tax deductible donations. 2002, May 22, Fyns Amts Avis: Tvind's used clothes collection boxes are no longer wellcome in the town of Svendborg, one of the most profitable collection sites of UFF/Humana Denmark. 2002, May 18, Fagbladet: The conflict at the Rio Culebra plantation in Ecuador is escalating. 2002, May 7, Dagens Nyheter: IKEA has previously information on Tvind done business with Trayton Group but has now decided to break off any connection with the Tvind owned company. 2002, May 4: Fyens Stiftstidende: At a Tvind plantation in Ecuador the workers are on strike not only because their wages are lousy but because they haven't been paid for weeks. The manager Ole Toft Andersen is under police protection. 2002, May 2: Berlingske Tidende: Tvind's furniture company in China, Trayton Group in Shanghai, is under local police investigation for smuggling, that is lack of proper paperwork when importing goods into China. 2002, Apr. 16, TV2: Police confirm that UFF Denmark (=Humana) is under investigation for chanelling funds from charity to the teachers group. 2002, Apr. 3, Jyllands-Posten: Amdi P. has volonteered to come to Denmark if the police would drop the embezzlement charges and only charge him with tax fraud. Danish police will not make such a deal. 2002, Mar. 30, Jyllands-Posten: Amdi Petersens extradition case is due in court in August. Unless he agrees to extradition before that time he is going to stay in jail all summer. 2002, Mar. 29, EkstraBladet: Judge Nora M. Manella in the LA District Court decided Thursday that Amdi P. is not to be released on bail. 2002, Mar. 25, Dagens Nyheter (Sweden): UFF Sweden is restructuring but TG still seem to have a firm grip of the organization. 2002, Mar. 24, Dagens Nyheter (Sweden): IKEA has been buying furniture from the Tvind controlled company, Trayton Group in Shanghai. 2002, Mar. 21, BBC4 broadcasts a ½ hour feature about Tvind in Denmark. 2002, Mar. 19, Radioavisen: The hearing today in LA has been postponed for a week by request of Shapiro. 2002, Mar. 16, Politiken: Some Tvind institutions operate without authorization or have been closed by authorities due to mismanagement or controversial pedagogical methods. 2002, Mar. 14, Berlingske Tidende has made a sound recording from the first LA court hearing on Feb. 19th public on the internet. Amdi Petersen says "yes, sir" when asked to confirm his identity and you hear a few other short answers to some basic questions. 2002, Mar. 10, Politiken: local authorities still send many problem kids to Tvind institutions in Denmark. Tvinds earnings in this line of business are ca. DKr 180 mio. 2002, Mar. 8, BT: According to Thom Mrozek of the US Justice Department Shapiro has filed an appeal for the release of his client. 2002, Mar. 1, several media. The usual suspicion is being stirred up over the last two weeks about Tvinds business at home and abroad but there is no substantial news. Amdi is lawyering up as they say in american films and no one knows the outcome of the next hearing on March 19th. 2002, Feb. 25, Politiken: Amdi P. stays where he is. Next court hearing is set for March 19th. In Denmark a person goes through three stages before a conviction: mistanke, sigtelse, tiltale. In the US there is only two: suspicion and charge. "sigtelse" and "tiltale" generally both translate into charge but persons under "sigtelse" can also be seen as suspects. (A person under "sigtelse" has the right to legal representation and to remain silent under interrogation) Robert Shapiro is trying to convince the LA court that Amdi P. is only a suspect and has not been formally charged (i.e. "tiltalt") but since a warrant for his arrest has been issued by Danish court(s) (local judge AND appeal court) there is no doubt about the legality of the Danish request following a mutual extradition agreement between Denmark and the US. A photo of Amdi P. seen from behind entering a bus for transportation to the jail is NOT the first of its kind in 23 years. A similar photo (by Rick Catlin of TheCayman Compass) from 1990 shows him entering a plane on Grand Cayman Island also seen from behind. 2002, Feb. 23, Søndagsavisen: Tvind is still expanding in Denmark, founding institutions for troubled children and youths. 2002, Feb. 22, BT/Berlingske Tidende: Amdi P. is being held in Kern County Jail, Bakersfield, California. The FBI has for unknown reasons picked him up at the jail to bring him to LA. Hearings about his extradition have been postponed until 19.30h CET friday. Local DA is recieving help from Danish colleagues. Kirsten Larsen and Ruth Sejeroe-Olsen stand by their man and have been photographed outside the court room. Only a drawing from the court room indicates how Amdi P. looks today - no press photos of him yet. 2002, Feb. 20, DR etc. : Amdi Petersen is still being held in prison in the LA area after the first hearing, but he has hired Robert Shapiro who used to represent O.J. Simpson and who has worked extradition cases before succesfully. Shapiro descripes Amdi P. as a great benefactor. 2002, Feb. 18, Ritzau: Amdi Petersen has been arrested by the Los Angeles Police by request of the Danish police. He was in transit from Africa to Mexico when apprehended. 2002, Feb. 6, Radioavisen/Holstebro Dagblad: Another four people are now under suspicion and have been charged in the case against the humanitarian foundation. At the same time the police are giving up investigations against one person, which means that altogether seven people are on the list. 2002, Feb. 2, Fyens Stiftstidende: Tvind is trying to get another small school running on the ship 'Hans Christian Andersen' of Nyborg. 2002, Jan. 26, Politiken: A Tvind foundation for fine arts (Kunstforeningen af 1985) has given up a sponsorship (appr. 3 mill Dkr.) for Karl-Heinz Stockhausen's opera "Mittwoch". After Stockhausens unfortunate remarks on 9.11 co-sponsors have been hard to find for the 3 Mill D-mark show. Chairman Sune Joergensen says that the foundation hopes it will be able promote "Mittwoch" at a later date. 2002, Jan. 24, Horsens Folkeblad/Vejle Amts Folkeblad: Local residents protest against a planned Tvind small school in Laerkenfeldt, Raadved. 2002, Jan. 23, Roskilde Avis: The town council of Roskilde is considering a termination of their cooperation with one of the Tvind schools in Roskilde (Heldagsskolen ved Roskilde Fjord) due to the schools very bad economy. 2002, Jan. 22, Ritzau: Plans have been made for The Tvind school in Faaborg, Nakkeboelle, to become partly a centre for refugees from Iraq and Afghanistan. Local authorities protest because they consider the mix of troubled youths and asylum seekers to be dangerous. 2002, Jan. 18, JydskeVestkysten: The former Tvindschool Lakolk on the island Roemoe, which was bought by Tvind as early as 1980, has now been sold and is being reconstructed as a hotel.